There have now been three in James McCreet’s masterly series set in the murky darkness of early Victorian London, the third of which – The Thieves’ Labyrinth – has recently been published by Macmillan in paperback at £14.99. This is good news for the many fans of its predecessors, The Incendiary’s Trail and The Vice Society, and the equally good news is that the fourth is on its way. 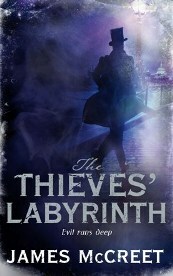 The Thieves’ Labyrinth takes Inspector Newsome and his erstwhile subordinate George Williamson into the murky world of the Port of London. On your website, you tell us that when you began your writing career you set out to create the kind of novel that you enjoy reading. You defined this as: ‘It would have an irresistible plot, interesting characters, great locations, engaging themes, memorable episodes and a style that openly luxuriated in the possibilities of language.’ Well, you’ve succeeded in all of these aspects in the three novels you’ve so far had published. Did you already have Victorian London’s darker side mapped out as an ideal way in which to fulfil these objectives? Actually, I came to Victorian London entirely accidentally. I’d never been particularly interested in the place or the era, but in 2007 I just happened to borrow a library book on the Victorian underworld and suddenly 1840s London seemed like a perfect location to realise the kind of story I wanted to write. It had that quasi-real atmosphere where almost anything might happen. I give Dickens all credit for his imagination, but the world he was writing about really did have its Fagins and its Artful Dodgers. It was – and is – a gift to any writer who loves the dark, the mysterious, the dangerous and the weird. The more research I did, the more the possibilities became apparent. The first of your objectives was the irresistible plot. The Thieves’ Labyrinth is aptly named from that angle. The plot is indeed a puzzle maze. Is it the puzzle that most intrigues you in the planning stage or does it become more complex during the writing itself? I plan the whole puzzle out before I begin writing. In fact, it’s the most difficult part of the process and drives me mad as I try to make it work. But I wouldn’t like to say that the plot is the most important element. It’s a connective tissue via which I get to test characters and introduce episodes and explore the city. I’ve always been interested in the origins of the genre and what stands out for me is how many literary intellectuals have enjoyed playing with the puzzle as a means of exploring something else. Edgar Allan Poe, Thomas de Quincey, GK Chesterton – they all appreciated how the mystery narrative allows a writer to play with perspective: to hide some things and show other things, like an illusionist’s distractions. That said, I do find that the writing process adds to the complexity. I veer from the plan because I like to frustrate my characters. Next come the interesting characters. A reviewer of one of your novels compared your approach to that of Dickens in that you have a colourful array of characters supporting your plot in addition to the leading ones. In The Thieves’ Labyrinth Baudrons takes an unforgettable bow alongside Eldritch Batchem and, in The Vice Society, Eusebius Bean. These are just three examples. Do the supporting cast come along during the writing or are they all part of your planning process – and do you have favourites amongst them? I do my research before I do the plotting, and many of the supporting characters are people I uncover or conceive during that process. Sometimes they’re so irresistible that I just have to make room for them in the plot, although I don’t introduce any characters during the actual writing process. They’re a lot of fun to write. They provide a bit of light relief away from the momentum of the plot, and occasionally they summarise a historical point far more concisely than any broader plot line. Certainly, they come alive when I drop them into a story. Baudrons (the ‘cat master’) in Labyrinth was supposed to appear only in one scene, but I liked him so much that I brought him in again later. Batchem was killed off earlier in a previous draft, but I gave him another chance. I find that some readers talk more about these incidental characters than the main ones. Keeping to the subject of the characters, you have an unusual and interesting approach in your novels in that you have not one but several ‘sleuths’ all hell-bent on tracking down the truth. It makes for fascinating reading, as in most crime novels the reader is identifying with only one sleuth pitted against the forces of evil. In your novels the plot thread is drawn together by the penny-a-liner narrator, instead of by one sleuth. Do you find that this approach gives you more latitude in the plot? It certainly keeps readers guessing. I think it goes back to that concept of perspective: what’s seen and what’s hidden. Plus, it does allow me more flexibility in plotting because each sleuth has his own distinct strand, even when ostensibly working with the others. The narrator allows us to see who’s lying and who isn’t – but only if he feels like it. Sometimes we’re not sure he’s telling the truth himself. I hope that I’m adding something to the genre with this approach and that readers are divided on which detective they like best. ‘Great locations’ come next on your list. You’ve lived in many places during your life and were born in Sheffield. Have you always had a love of London and how did you come to know it so well that you can write about it in such detail? Through your website (www.jamesmccreet.co.uk) you present some excellent videos of London and its history. Do you ‘walk the ground’ you are writing about? Not much left in some places, but still possible to imagine despite the vast changes to London in the last century. I’ve never lived in London, though my dad was Fulham-born and I used to visit grandparents there as a child. Now, I rely on extensive research and a selection of maps from the 1840s to guide me around the streets. I also make occasional visits there to check conditions on the ground. For example, I went in search of Holywell Street when researching Vice Society and discovered that it had disappeared in the early twentieth century, replaced by Australia House. Recently, I was in the crypt of St Bride’s off Fleet Street researching the fourth book. 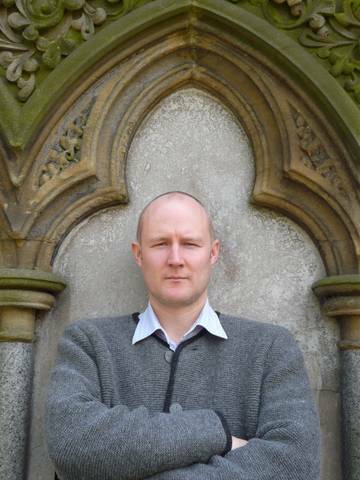 The crime genre was born out of the metropolis, whether London, New York or Paris, and I think London makes a great location due to its many layers of history. My characters are 170 years old, but they’re visiting parts of the city that are ancient even to them. ‘Engaging themes’ is the next aspect you mention. Your ongoing stories are deftly handled, with the reader never being quite certain whether they have seen the last of a particular character. In The Thieves’ Labyrinth Lucius Boyle is mentioned like a Moriarty who might or might not reappear at the Reichenbach Falls, I did wonder whether Eldritch was a reincarnation of Eusebius… Do you have an overall plan as to where these ongoing characters are heading? I conceived these novels as a five-book series in which characters would grow and possibly recur. I don’t want to give anything away, but the full set should provide a few surprises. Sometimes a character is too good to die … and the body of Eldritch Batchem was never found. ‘Memorable episodes’: there are plenty of those in your novels. Balloons, the Monument, and in the latest novel the river and sewers of London. Do you find these scenes fun to write? They certainly offer great scope which you use skilfully. I have always been a fan of Fleming’s James Bond novels, which make great use of episodes. There’s the garden of death in You Only Live Twice, the mud baths in Diamonds Are Forever, the death tunnel in Dr No, the underwater swim in Live and Let Die. They are all clearly things which interested the author and which he wanted to write about. It’s the same for me – I come across these places or ideas in my research and I just have to use them. I challenge anyone to ascend the Monument in London and not think about the suicides or the Great Fire that began at its foot. Also, genre titles are too often ‘disposable’ – once you’ve solved the mystery, you move on to the next one. I like books that I can pick up over again to enjoy individual scenes. The episodes are there partly for that reason. ‘Openly luxuriated in the possibilities of language’: your carefully thought out style is a prominent feature throughout all your novels and a delight to read. Do you have an ear for all languages? Can you hear your dialogue, and indeed narrative, spoken as you write? I don’t pretend that my dialogue is realistic. In fact it’s quite stylised, as is the whole narrative voice. The thing is, I’ve always been a voracious reader – just as happy reading Jackie Collins as I am reading Nabokov or Anthony Burgess – and I suppose my ambition is to combine so-called genre fiction with so-called literature to create something that has a solid plot but also language that really engages the reader. I love words. I even love punctuation. But I see it all as writing – I never speak it out loud. There are intentional rhythms and rhymes in the prose that an actor might be able to do justice to, but I hear it only in my head. One of your degree subjects was Shakespeare. Do you ever get tempted to explore Elizabethan and Jacobean London in fiction as you have the Victorian era? It’s taken me long enough to learn about Victorian Britain! That said, I’ve spent the last six months researching the South Pacific in the 1830s in preparation for a prequel to this series (in which Ben and Noah first meet in Tahiti). I do hope, however, that my debt to Shakespeare is apparent in these London books. ‘Batchem’ is, after all, an anagram . . . Your novels concentrate on the dark side of Victorian life. Do you think you would ever want to explore the middle and upper levels of society in your writing, if only to see where they merge? I’d argue that we do get a glimpse of the other classes. 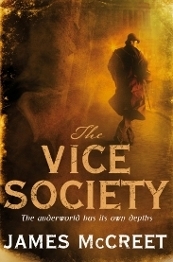 There’s the gentleman’s club and the gentleman’s asylum in Vice Society, and the high-class courtesan also. On the other hand, I’ve found that the majority of research is to be found in the gutter. The posher set obviously knew how to keep their secrets. The narrator of The Thieves’ Labyrinth melts skilfully into the background of the plot and is never fully explained. Is he to any extent ‘you’, or do you see him as a character in his own right? I’ve got a bit of stick about my narrator. Some love him, while others seem to dislike him greatly. He’s certainly not me, though I appreciate his lifestyle as a hack writer. My intention from the beginning has been that he represents both the investigative eye and the notion of observation in a time before photography. We see only what he allows us to see, and we see it though his own strange sensibility as a man whose job is to make up stories for money. Indeed, as a writer and journalist, his role is very like that of the detective in finding the clues to create a story. He is definitely a character, and one who will turn out to be highly significant by the end of the series. Lastly, the fourth novel is on its way. Can you give a hint as to what its ‘engaging theme’ is to be? The fourth book was finished in December and is provisionally entitled The Masked Adversary. It’s a little longer than the previous books and, in my opinion, is the best of the lot. It sees Noah, Mr Williamson and Inspector Newsome drawn into a truly bizarre case which, again, turns out to revolve around true identity and the figurative or literal masks of metropolitan society. Recently, the Crime Writer’s Association ran a survey to find out which writers had killed a victim in the most gruesome manner. One of mine, from the fourth book, was chosen in its top ten: taxidermied alive. Taxidermied? Who could follow that? Answer: I’m sure you can. Many thanks, James, and all good wishes for the rest of the series.